The Ordinance number182 of the University of Pune implemented through a circularissued in 2008 puts stringent terms and conditions in providing answer sheets to a student, which are contrary to the provisions in the Right to Information (RTI) Act. These include: not providing certified copies of answer sheets; students to apply for answer sheets within 10 days of the results; applicant to apply for Photostat copies of maximum three subjects only and; copies to be provided within 45 days through the principal of the college. In August 2011, the Supreme Court has ruled that evaluated answer sheets are covered under the definition of ‘information’ under the RTI Act. Hence, this overrides any rule or ordinance that an educational institution may have had. (Read—Ultimate victory for students: Supreme Court judgment orders access of copies of answer sheets of all examinations. Like the Official Secrecy Act of 1923, which has been overpowered by the RTI Act, the Ordinance no. 182 of the University of Pune too is as good as non-existent and it is the rules under RTI that are applicable to the University. However, University of Pune continues to dictate its own terms as per its 2008 rules. As per Point No. 19 of Ordinance of the University of Pune Rule No. 182 in respect ofanswer sheets which states as under that, “The Certified copies of revalued answer sheets are not provided.’’…above Rule No. 182 of Ordinance issued by the University of Pune is completely contrary to the provisions of the Right to Information Act and to the judgment of Supreme Court of India in the case of Central Board of Secondary Education and Anr Vs Aditya Bandopadhyay and Ors reported in Civil Appeal No. 6454 of 2011. The Supreme Court has thereby ruled that the definition of information in Section 2 (f) of the Right to Information Act, 2005, refers to any material in any form which includes records, documents, opinions, papers amongst several other enumerated items. The term ‘record’ is defined in Section 2(i) of the said Act as including any document manuscript or file amongst others. When a candidate participates in an examination and writes his answers in an answer book and submits it to the examining body for evaluation by an examiner appointed by the examining body, the evaluated answer book becomes a record containing the ‘opinion’ of the examiner. Therefore, the evaluated answer book is also information under Right to Information Act, 2005. It is further stated that if the rules and regulations of the examining body provide for re-evaluation, inspection or disclosure of the answer books, then none of the principles of the Maharashtra State Board or other decisions following it will apply or be relevant. It is also stated that, Point No. 16 of aforesaid Ordinance 182 states that, “the University shall supply the photo copy/copies within 45 days from the date of receipt of application through the principal of the college concerned”. It is stated that, the aforesaid point of the ordinance is directly and completely contrary to the provisions of Section 7 of the Right to Information Act, 2005, which states that 7. Disposal of request—(/) subject to the proviso to sub-section (2) of Section 5 or the proviso to sub-section (3) of Section 6, the Central Public Information Officer or State Public Information Officer, as the case may be, on receipt of a request under Section 6 shall, as expeditiously as possible, and in any case within thirty days of the receipt of the request. either provide the information on payment of such fee as may be prescribed or reject the request for any of the reasons specified in Sections 8 and 9: 6 This provision mandates the information which is sought has to be provided to the applicant within the maximum period of thirty day and no further extension is allowed by the provisions of the Section 7 of RTI Act, 2005. Therefore, the time period of 45 days is completely and directly contrary to the provisions of RTI Act, 2005, and needs to modify accordingly. 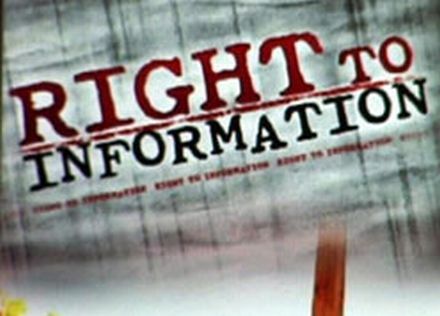 It is also stated that the RTI Act, 2005, is a central enactment and has to be followed in its true spirit and any provision/ rules made by any public authority contrary to the provisions of the RTI Act, 2005, shall attract the provisions of the Section 22 which reads thus “Act to have overriding effect—the provisions of this Act shall have effect notwithstanding anything inconsistent therewith contained in the Official Secrets Act, 1923 (19 of 1923), and any other law for the time being in force or in any instrument having effect by virtue of any law other than this Act”. (Vinita Deshmukh is the consulting editor of Moneylife, an RTI activist and convener of the Pune Metro Jagruti Abhiyaan. She is the recipient of prestigious awards like the Statesman Award for Rural Reporting which she won twice in 1998 and 2005 and the Chameli Devi Jain award for outstanding media person for her investigation series on Dow Chemicals. She co-authored the book “To The Last Bullet – The Inspiring Story of A Braveheart – Ashok Kamte” with Vinita Kamte and is the author of “The Mighty Fall”.